Last Saturday André Villas-Boas' Tottenham defeated Manchester United in their own turf, something Hotspurs hadn't done in 23 years - which may well be just what the doctor ordered for AVB's team. Every single goal from the Lilywhites came from United worryingly tendency to be overrun against stronger sides, over the past couple of years (namely after Carlos Queiroz left). With Carrick and Scholes in the centre, and Nani and Giggs on the wings, pockets of space were bound to appear on United's defensive midfield, but the appalling display from his midfield and defence must have Sir Alex Ferguson quite worried. 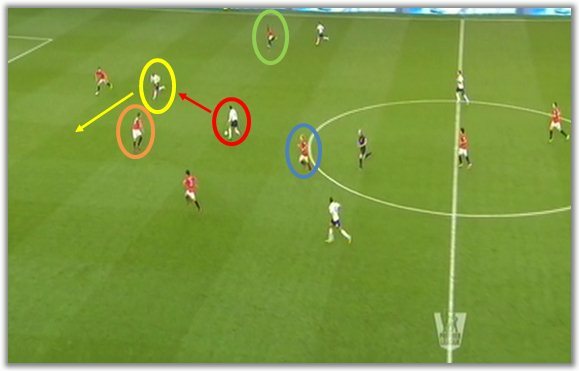 For that matter, Tottenham's goals will be dissected, in order to shed some light over the Red Devils' frailties. There were some repetitive patterns throughout the match as far as defensive positioning is concerned. 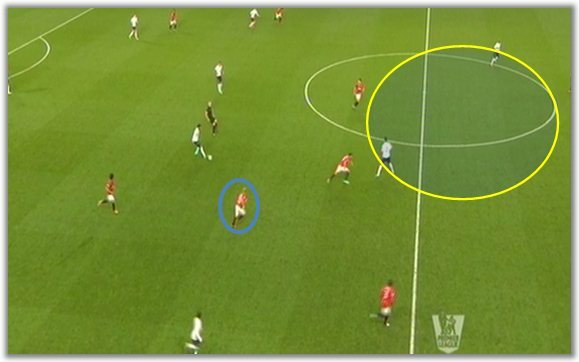 In this particular case, you can see that both Carrick (green) and Scholes (blue) are away from the ball and not offering good defensive coverage. The yellow dotted lines represent the one-two played by Vertonghen (the eventual goalscorer). 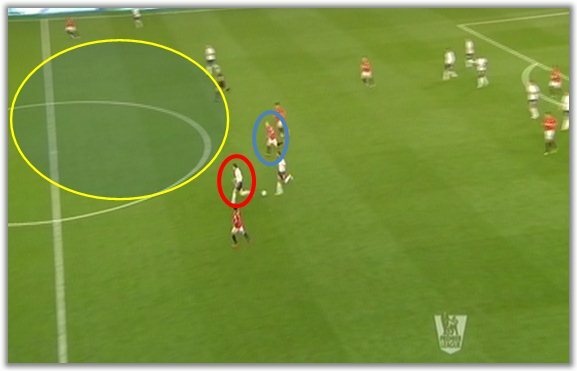 Jermaine Defoe (yellow) read the game very well and immediately drifted toward the flank, dragging Rio Ferdinand out of position. 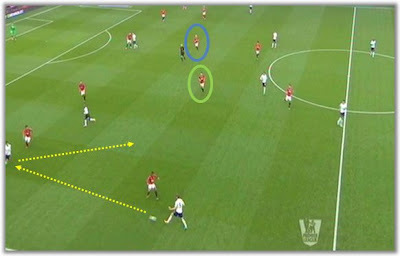 With the one-two, Vertonghen has already overcome Nani's feeble opposition. 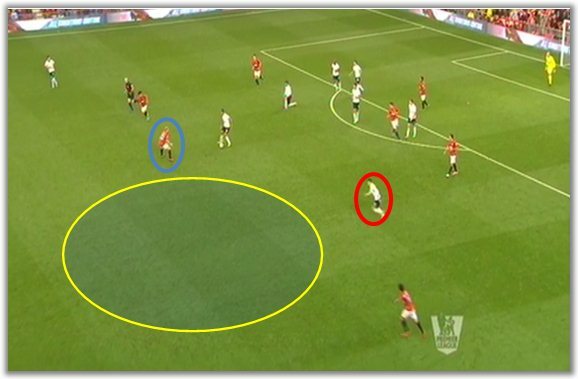 Defoe's movement opened up a huge hole in the centre of Manchester United's defence (shaded area). 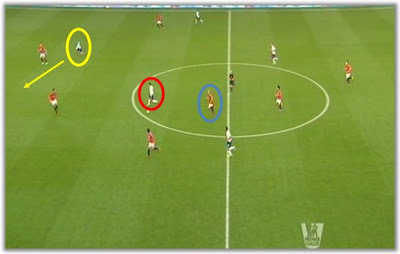 Carrick (green) and Scholes (blue) are already late and out of position. 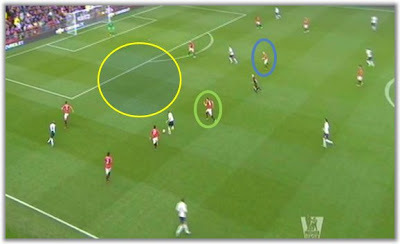 Even after a few seconds, Carrick (green) and Scholes (blue) are still behind Tottenham's player, who had to control the ball and resist his markers' attempts. Ferdinand also hesitates and the critical area of the field (shaded area) from which Vertonghen will score is left unprotected. Manchester United have lost the ball just a couple of seconds earlier. Scholes (blue) neither pressures the Dembélé (the player with the ball) nor provides coverage. The shaded area represents the huge gap in the middle into which Tottenham were often allowed to break. Gareth Bale (red) started out near his area and would eventually score the goal. Dembélé easily avoids Scholes and no Manchester United player comes up to either keep the team compact or try to force Tottenham out wide. Gareth Bale has already gone past his "marker" and has a whole lot of field to run into (shaded area). Once again Defoe (yellow) shows an intuitive understanding of the game and starts running contrary to the run of play, dragging Jonny Evans out of position. Bale (red) gets the ball in space and there is no one remotely close to him. 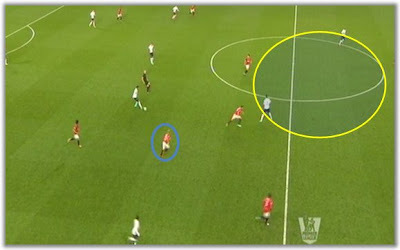 Scholes (blue) is already 5 metres behind him. Tottenham have an all too easy 2v2 situation in a matter of seconds. 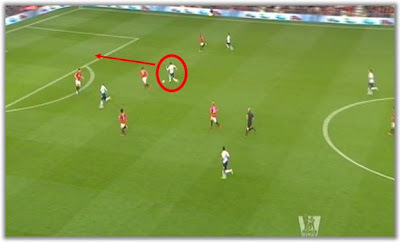 Even after all this time, Evra remains way out on the wing, where he is not of any help whatsoever. Defoe (yellow) continues his movement and Bale (red) attacks the space his team-mate has just vacated - a textbook counterattack play. 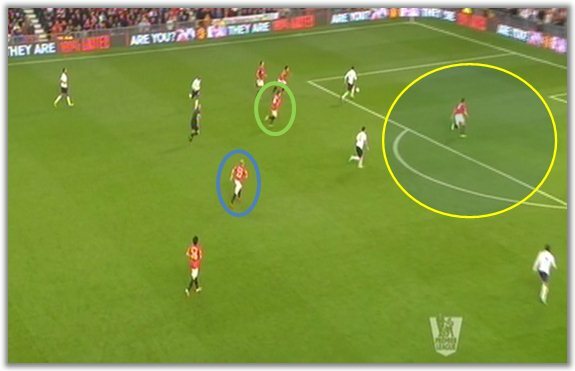 Notice the distance between the Welsh winger and Ferdinand (orange). Bale would score the goal ahead of the English centre-back. 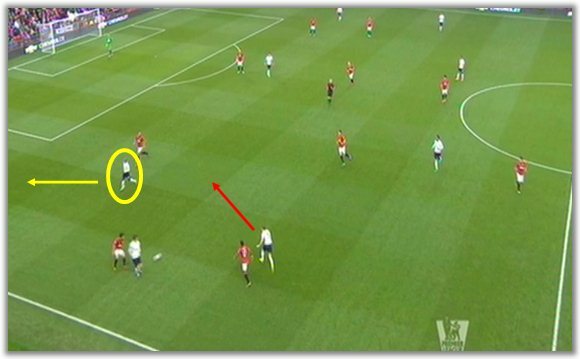 With Evans out of the picture, thanks to Defoe's hard work, Bale (red) has an open road toward the goal. Again, neither Carrick, Scholes, Evra or Rafael are the least bit near to help out. Bale's goal was definitely much easier than it should have been and teams in the Champions League will be looking to pounce on this evident weak link in United's defensive approach. Once again United had just lost the ball a could of seconds earlier. Dembélé easily goes around Scholes (blue) and finds himself totally unmarked. With Scholes already behind, Dembélé can pick his pass. The shaded area represents the huge gap that United have once again opened up between their lines and how a simple long ball could bypass all of United's midfield. In all honesty, this play was just utter nonsense. Ferdinand (orange) is once again dragged out of position following Dembélé's long ball towards Defoe. 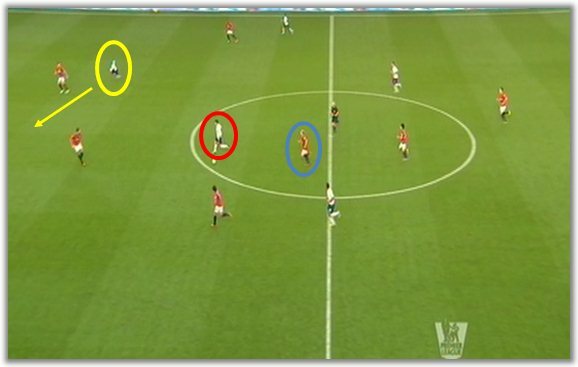 Carrick (green) and Scholes (blue) are neither pressuring or providing coverage. 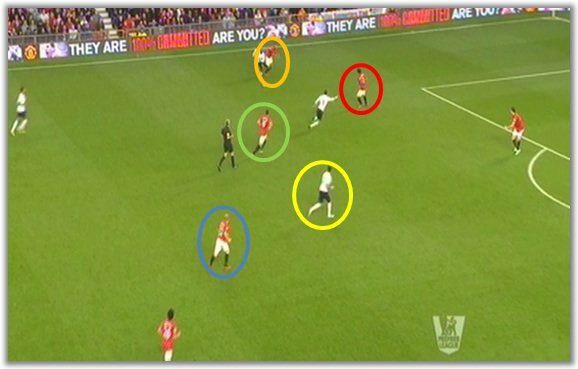 To make matters worse, Rafael (red) seems to keep lacking a basic understanding of his duties and stays in line with Ferdinand and Evans, instead of taking a couple of steps back. Notice how Bale immediately picks up on it and asks for the ball in space with his arm. Clint Dempsey (yellow) remains absolutely unchecked in the critical area of the field. Defoe played the ball into Bale's path for him to shoot at goal. 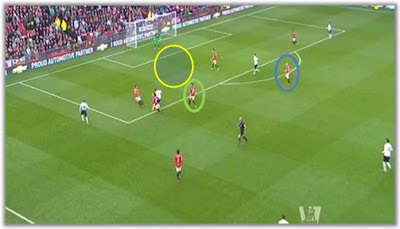 Carrick (green) and Scholes (blue) allow their opponents to breeze past them. 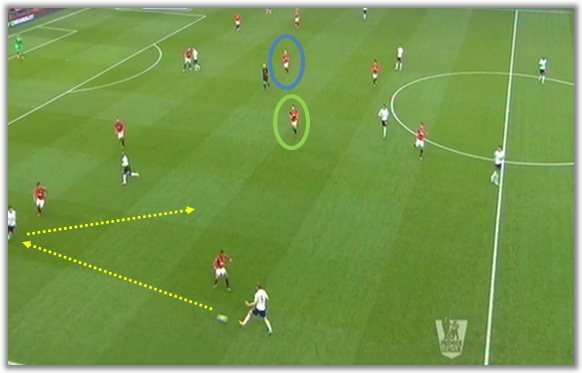 In the most important area of the pitch, Evans is alone (shaded area) against three Tottenham players. Logically enough, Dempsey found it extremely easy to pick up the rebound after Lindegaard's save and score Tottenham's third goal of the day. If Manchester United are serious about taking the title back from City and/or improve on their shambolic performance in Europe, they will be well advised to drill their defensive positioning extensively. If not, they will certainly be made to suffer at the hands of any team capable of breaking quickly through the middle. As time goes by, it remains harder and harder to understand why exactly Sir Alex Ferguson insists on leaving his midfield area that bare. As for Tottenham, even though he didn't score or even provide an assist, Jermaine Defoe was instrumental for the win, as Michael Cox so eloquently put it. His clever movement was critical to drag his team-mates' opponents out of position and should go to show that a forward's job revolves around much more than just putting the ball in the net.